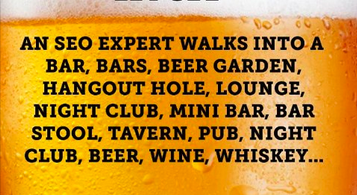 An SEO expert walks into a bar…. I thought I’d start the year off with this joke…. it’s pretty funny for SEO practitioners but also highlights how we think of words in an algorithmic sense. There’s a lot more words in our consciouness than ever before, thanks to search engines. We just don’t think of flicking to “P” in the yellow pages book to find a plumber.. today, we think “best plumber menlo park” or “plumber reviews”. So remember that when you’re ordering your next Blue Moon, Fat Tire or Corona.